Among the multitude of Warhammer 40k games that have swarmed across gamers’ PC’s the last couple of years, only a few really stood out as interesting uses of the license. One of my favorites from last year was Gladius: Relics of War. This 40k take on the 4x genre was a streamlined and fast paced rendition of the classic 4X formula. Diplomacy was completely tossed out the window in favor of a massive roster of units, each with their own distinct tactical uses. If you aren’t familiar with the game at all, check out my review here for all the details. Now we have the first new faction DLC for the game, bringing an alien horde perfectly suited to the battlefields of Gladius: the Tyranids. While the DLC doesn’t change the overall structure of the game much, the Tyranids come with their own set of unique mechanics that are a masterclass in matching theme and gameplay. If you’re reading this, then you’re probably familiar with the Tyranids already. These are the Zerg of the 40k world. Giant, nightmarish swarms of monsters that resemble a varied assortment of giant space bug dinosaur things. They’re all teeth and claws, plasma launchers and acid blood, controlled by a mind hive consciousness and numbering in the trillions. They feel no fear, no remorse, and only desire one thing: to consume all biological life everywhere they go. Sounds like some great new neighbors, right? While the Tyranids have a number of fearsome and deadly units in their arsenal, they actually begin the game quite weak. The lower tier Tyranid units are cheap and many are fast, but they can’t venture too far by themselves. Remember that part about being controlled by a hive mind? Not all of the Tyranid units have a direct “synaptic link” to the hive. Every turn spent out of direct contact with the hive causes these units to lose health and they can even become feral if detached too long, causing the player to lose control of them. This means that you must keep a more powerful unit around that can act as a relay for the hive mind. I really liked how this forced you to make some tough tactical considerations. Use your big bads to spearhead an offensive, and you risk their destruction. Losing your link to the hive could cause an offensive push to completely disintegrate. Playing as the Tyranids involves a lot of expansion and contraction of your forces. Send some fast scouts out for reconnaissance, quickly pull them back to a synaptic linked unit, then concentrate your forces and move towards whatever goal you have in mind (i.e. consuming everything in your path). This makes playing the Tyranids tactically distinct from other factions. Each group of weaker units needs a synaptic unit as the core of their group, and they must all move together to be fully effective. Compare this with the Astra Militarum (Imperial Guard) who’s lowliest unit of guardsmen can at least be stationed alone in some remote corner of the map to watch over a flank. For the Tyranids, a grouping of units is almost always necessary for any task. The Tyranids do not hold ground very well, they must always be on the move in one direction or the other. On the strategic level, the Tyranids have some distinct differences as well. Resources have been distilled down to just two things, biomass and influence. Biomass is the organic matter that the Tyranids melt down and turn into all of their fearsome creatures and buildings. You get this by stripping the land bare and building up certain base structures. Unsurprisingly, you always need more, more, more. You can also reclaim some biomass by bringing units back to base to be tossed back into the bubbling goo. While this sounds like a minor gimmick, it’s actually entirely necessary for smoothly switching gears between one tier of units and the next when you are running tight on resources. A situation I found myself in several times. The other resource important for Tyranid strategy is influence. This is used to power many buildings and some key special abilities. You can burn through a lot of influence in a hurry by scooping up extra biomass anywhere on the map with the Malanthrope unit, or to keep units under control longer when they are away from the hive mind. Having just the two key resources for all of your production and abilities may sound simple, but it actually creates an interesting economic situation where you are constantly balancing one with the other, while trying not to simultaneously run out of both. A great touch to the game is how the Tyranids actually change the appearance of the map around them as the game progresses. The expansion of your hives and the special ability of the Malanthropes literally strips the planet to the bedrock, removing all vegetation and any trace of life one hex at a time. Gladius isn't all that pretty to begin with, and the Tyranids do their best to make it look even worse. Like the other factions, the Tyranids have a tech tree mostly focused on unlocking new units and then bigger and badder upgrades for them. You can choose to spread research around to give yourself a lot of options, or focus on upgrading one particular line of units quickly. I really liked the variety of units offered for the Tyranids. You of course have hulking monstrosities that you can load up with tons of weapons, but there are also incredibly fast units for hit-and-run tactics, a stealth unit, and a hero that can allow you to move units around underground. All of these options, with the general mix of units between cannon fodder infantry and the big stuff that could startle a Space Marine, give the Tyranids a great roster to choose your army from. 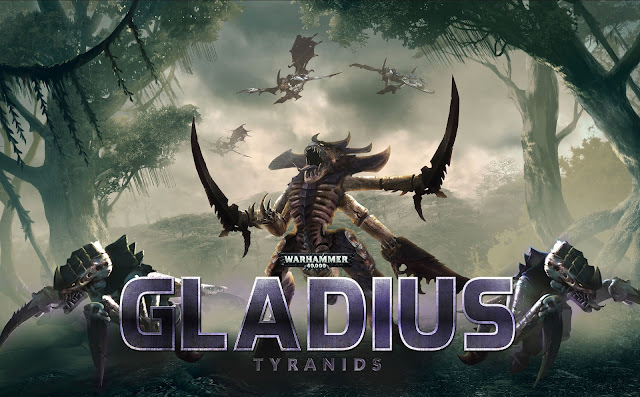 While the Tyranids may sound like an unstoppable faction ready to swarm over everyone else on Gladius, they are actually rated “Hard” (along with the Imperial Guard faction) and this was no lie. My first run at the game on normal difficulty ended with my being overwhelmed by two enemy factions and some neutral units at the same time. This was mostly my fault for trying to spread out too far, too fast. On my second run I took the difficulty down a notch to Easy. Around turn 200 I’m still alive, but it’s been a struggle most of the way. The enemy AI pulls no punches and the world itself is hostile to your presence. Look at all that lovely biomass, ready to be consumed. Lastly, I wanted to touch on the updates to Gladius overall since launch in July last year. A long series of small updates and tweaks has really polished what was already a solid experience. The most impressive is the enemy AI, which for me presented a serious challenge. In a big name 4X series which uses the same sort of hex-based combat and rhymes with Bivilaration, it has long been a common sight to see an AI make bone-headed moves with their units and waste them on futile attacks while marching right past much easier targets. Not so in Gladius. Here the enemy forces will swarm out of the fog of war if you venture near their territory, only to immediately pull back if you are able to heavily outnumber them. Enemy units routinely scout the edges of your territory, snapping up undefended strategic resource locations and prodding deeper where they can. The enemy will give battle when they have a large enough force, and then reinforce or retreat as the fight goes one way or the other. It was rare to get an easy kill on an enemy unit without extending your own forces into the no-man’s-land. The Imperial Guard won't go down as easily as you might imagine. As you can tell from my review, I really like the Tyranids expansion for Gladius. While the game has a had a couple small DLC since launch, this is the first addition of an entire faction and it has set the bar very high. The matching of theme and gameplay mechanics is top-notch and makes the Tyranids a fresh experience even for veterans of the game. I imagine we are guaranteed to see more factions added over time, and I hope they are all done this well.